“If this is your first taste of Howard, I envy you.”—From the Introduction by George R.R. MartinAcclaimed cult author Waldrop's stories are sophisticated, magical recombinations of the stuff our pop-culture dreams are made of. Open this book and encounter jazz singers, robotic cartoon ducks, nosferatu, angry gorillas, and, of course, the dodo.The first paperback (and twentieth anniversary) edition of a landmark debut collection. Waldrop’s capacious, encyclopedic knowledge of superheroes, baseball players, world wars, long-dead film stars, Mexican wrestlers, pulp serials, and fairy tales is put to good use in these sophisticated re-combinations of oddball television shows, radio plays, scientific expeditions, extinct species, knock-knock jokes, and questions like these: * What if the dodo wasn't extinct after all? * What if sumo wrestlers could defeat their opponents with the power of the mind? * What if Izaak Walton and John Bunyan went fishing for Leviathan in the Slough of Despond?Never published in paperback, long out of print, and extremely collectible, Howard Who? was Waldrop's seminal debut collection. If you haven't read Waldrop before, you're in for a treat. "The best Waldrops tend to mix the humorous and wistful.... Italo Calvino once said that he was "known as an author who changes greatly from one book to the next. And in these very changes you recognize him as himself." Much the same could be said of Howard Waldrop. You never know what he'll come up with next, but somehow it's always a Waldrop story. Read the work of this wonderful writer, a man who has devoted his life to his art -- and to fishing. "—Michael Dirda, Washington Post"A charming collection. "—Los Angeles Times"Back in print after so many years, Howard Who? remains a terrific collection of short stories. 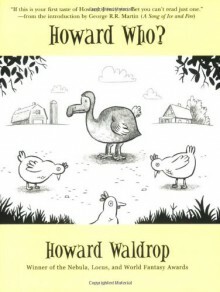 There is nobody else alive writing stories as magnificently strange, deliriously inventive, and utterly wonderful as Howard Waldrop." —MetrobeatTable of Contents Introduction by George R. R. Martin. The Ugly Chickens Der Untergang des Abendlandesmenschen Ike at the Mike Dr. Hudson's Secret Gorilla . . . the World, as we Know't Green Brother Mary Margaret Road-Grader "Save A Place in the Lifeboat for Me Horror, We Got Man-Mountain Gentian God's Hooks Heirs of the PerispherePraise for Howard Waldrop:"Clever, humorous, idiosyncratic, oddball, personal, wild, and crazy. "—Library Journal"Wise and funny. "—Publishers Weekly"An authentic master of gonzo sf and fantasy. "—Booklist"Erudite and gonzo. "—Science Fiction Weekly"Waldrop subtly mutates the past, extrapolating the changes into some of the most insightful, and frequently amusing, stories being written today, in or out of the science fiction genre. "—The Houston Post/Sun"The man's a national treasure! "—Locus"The resident Weird Mind of his generation, he writes like a honkytonk angel. "—Washington Post Book WorldAbout the Author:Howard Waldrop, born in Mississippi and now living in Austin, Texas, is an American iconoclast. His highly original books include Them Bones and A Dozen Tough Jobs, and the collections All About Strange Monsters of the Recent Past, Night of the Cooters, and Going Home Again. He won the Nebula and World Fantasy Awards for his novelette "The Ugly Chickens."